Goods & Services Tax will impact accounting and invoicing processes across industries for both Chartered Accountants and Businesses. After July 1, businesses and accountants will have to adopt software and ERPs which are capable of managing taxation, invoicing & accounting as per the new tax regime. 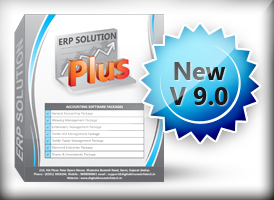 ePlus ERP being a pioneer in the industry will help you understand the technical aspects of the implementation of Goods and Services Tax, the impact on ERP systems, and what you need to do to be tax compliant in this section. Digital Dreams Infotech has a wonderful track record from over a decade of time period in delivering high quality solutions like "PLUS" Accounting Software. It's a powerful application that totally matches with its name providing flexibility and customization customer asks for. This is the core reason why customer like our Accounting Software and are using since many years. Digital Dreams Infotech is obsessed for providing Innovative Software Products and Services since 2000 in Surat. In this modern era of day-to-day changes we have mastered the art in developing DOS/Windows based Accounting Software with over a decade of experience. We hold competitive edge over other firms in providing The Best Quality Assured Software Solution which are very user friendly. The answer of the question of why should Digital Dreams Infotech be given an assignment is - the experience of working with wide range of accounting packages of various sectors like Textile, Diamond, Embroidery, Share Market, Weaving, Retailer & Distributor Industries along with customization in the software according to their requirements. Our clients are from SME as well as Large scale enterprises. In today's world of internet if you are looking to save time & money but increase your business, then web based application is always the first choice to help you out .We have been developing web based applications projects of different types which includes Flash, E-Commerce, Dynamic, Corporate and Static website development. By using latest technology like PHP, Flash, Microsoft Silverlight, Microsoft .Net Technologies, SQL Server, MySql & Firebird. Our Accounting Software has been designed and developed in such a way that it meets all the general accounting requirements and it also offers the most powerful, versatile, flexible and easy way to achieve the desired solution.